Wait until you see what treats we have in store for you below… Whether you want to delve into the mind of cinematic royalty or perhaps the treasures of Egyptian royalty is more your thing, we’ve uncovered some once in a lifetime experiences that you can be sure everyone is going to be talking about later this year. Discover the technology behind the future of ethical meat eating and remote creative collaboration. We’ve even got more inspiring feats of design – turns out the guys over at Pantone like our style! Arguably the most iconic and influential Director of all time – Kubrick has more than made his mark on cinema, he’s left an impression on culture and several generations of viewers. 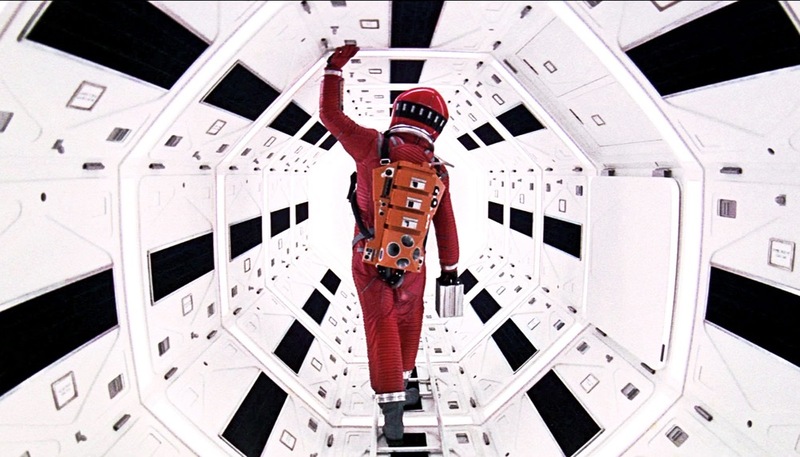 From groundbreaking projects such as 2001: A Space Odyssey to Clockwork Orange and The Shining, he revolutionised the cinematic experience through his unique blend of dark humour, pioneering cinematography, extensive set designs, and evocative use of music. So it comes as no surprise that there’s a wealth of Kubrickian paraphernalia out there that would make many of us weak at the knees! And it’s coming to London, courtesy of the Design Museum. Yes, your eyes don’t deceive you: From 26th April – 17th September, you can immerse yourself in the mind of the man himself and indulge in the vast archive of original props, costumes, set models and rare photographs, all the while learning about the design story and fascinations behind Kubrick’s body of work. Hailed as one of the must-see cultural events of 2019 according to the BBC, Time Out London, Evening Standard, Dazed Digital (and practically everyone else that’s heard the news! ), this is one exhibition you don’t want to miss. Ok how’s this for exclusive… The largest collection of treasures ever to leave Egypt (a whopping 150 original artefacts, 60 of which have never left Egypt before) are heading to London for a 6 month holiday – which organisers say will never happen again. Now that’s what we call limited edition! 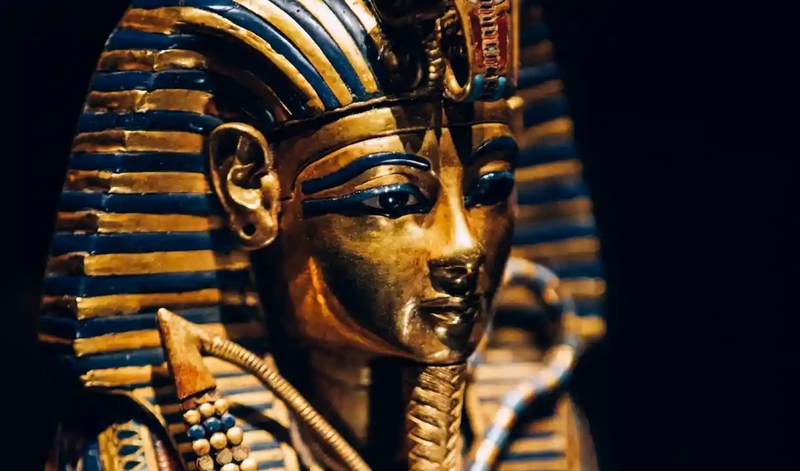 Commemorating almost 100 years since the discovery of King Tut, the largest collection of the young king’s treasures ever to travel out of Egypt will be showcased at the Saatchi Gallery in London from 2nd November 2019, until 3 May 2020. Spread across nine immersive galleries, incorporating digital content, audio, contextual material and custom soundscapes, visitors will follow Tutankhamun’s journey into the afterlife, reinforcing the Pharaoh’s immortality. This will be a rare opportunity before the historic treasures return to Cairo to be permanently housed with the rest of the collection at the new Grand Egyptian Museum. The ancient legend captured imaginations around the globe when in 1922 his tomb was unearthed and the only in tact Ancient Egyptian royal tomb was discovered. An instant worldwide sensation has continued for almost a century since which has lead to art, architecture and advertising in the 1920s being heavily influenced by ancient Egyptian motifs. 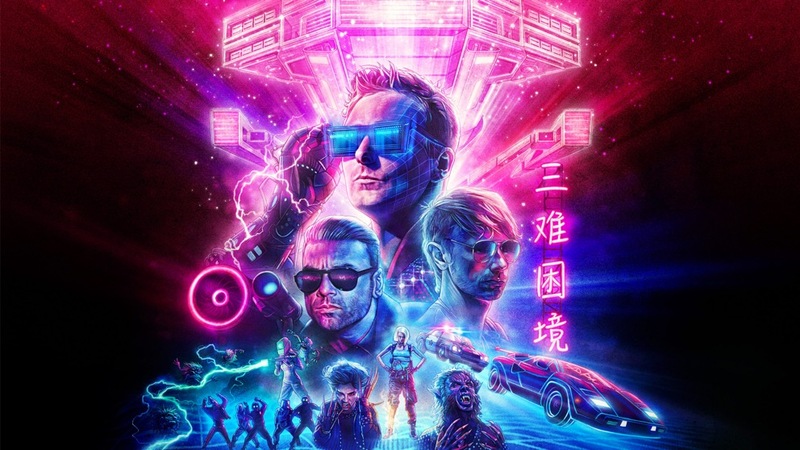 Muse have been busy collaborating with Microsoft since early 2018 to bring three songs to life in an immersive and innovative new way. The interactive tour will feature a once in a lifetime experience for fans in the form of original virtual reality games which are inspired by the tracks, blurring the lines between fantasy and reality. As most fans will tell you, the electro-rock band are at their best in a live setting, where they usually put on a huge dystopian themed spectacle. What they may not know are the details of this top secret tour. The songs are being kept under wraps – only available fans who purchase the “Enhanced Experience” package, which includes a premium concert ticket, access to the Muse Mixed Reality Pre-Show Party, an exclusive show-specific poster, and apparently much, much more. Mysterious! There’s nothing more alluring than good design. It can take almost any form, from functional to full blown hypnotic! Whatever the case, it commands attention. Running from 21st – 23rd May, the award-winning Clerkenwell Design Week returns for its 10th year as the UK’s leading independent design festival. Every year it attracts members of the design community from all over the world for three days of exhibitions, showroom events and special installations showcasing the freshest styles of furniture, lighting, textile and product design. With more creative businesses and architects per square mile than anywhere else on the planet, many don’t realise Clerkenwell is one of the most important design hubs in the world. Celebrate this stylish community and take your flair for interiors to the next level, with a first look at the latest designs to get everyone hot under the collar this season! 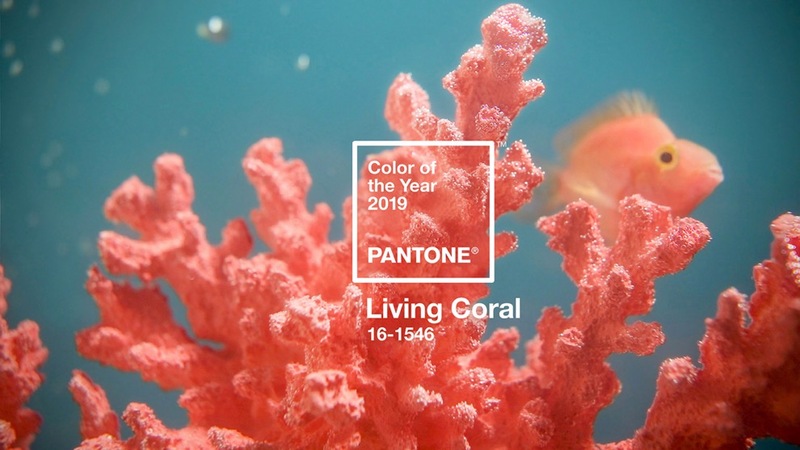 Colour experts Pantone have chosen a peachy orange shade named “Living Coral”, as their colour of the year for 2019… and we of course love it. Not too far off our own peachy shade, the Living Coral is described by Pantone as an “animating and life-affirming coral hue with a golden undertone that energises and enlivens with a softer edge”. It even sounds like us! 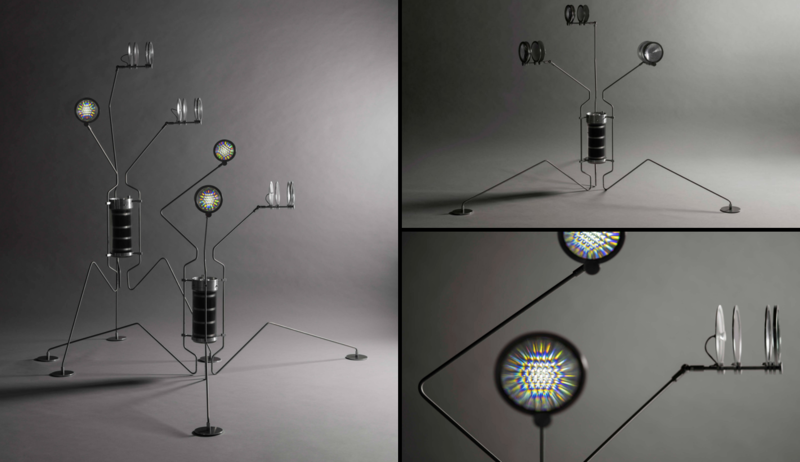 The Dutch designer has developed a sustainable light source from living organisms that require regular nourishment in return for their electrical output. The project currently takes the form of a “living light” installation that looks equal parts robot and alien. The strange being is entirely powered by micro-organisms that excrete electrons, which isn’t too dissimilar a principal to how we humans exist. Teresa van Dongen wanted to develop a more eco-friendly alternative to current energy and light sources, that could be used in the domestic environment. It all looks and sounds very Arthur C. Clarke to us. Very cool indeed. Hows this for a delicious bit of eye candy? This immersive installation offers a kaleidoscopic experience of light colour and space. Designed to be unique on all sides, it’s constructed from iridescent cords intertwined around a lightweight steel lattice structure – so when viewers walk around the piece, the patterns in the background and foreground continuously converge and de-laminate, creating a unique illusion that the static surfaces are somehow in motion. 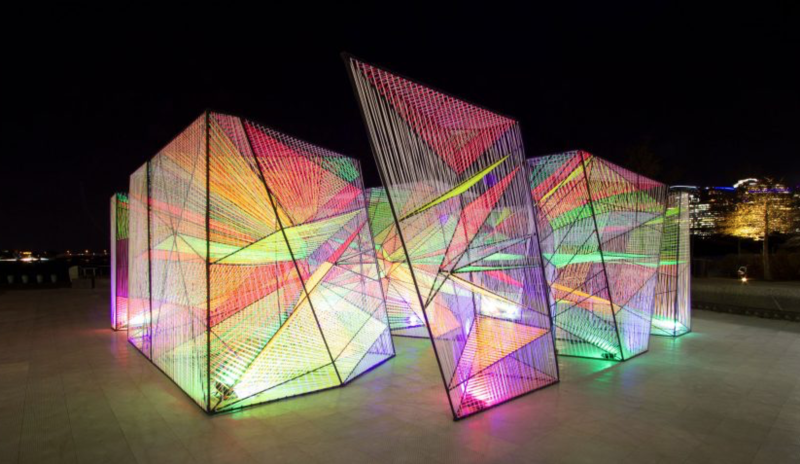 The Prismatic installation was displayed in Washington DC and created by New York-based studio Hou de Sousa. No, we haven’t sneezed and that’s not a typo either. The Greeks amongst you may have worked out that Grafeiophobia translates as a fear of desks or offices! 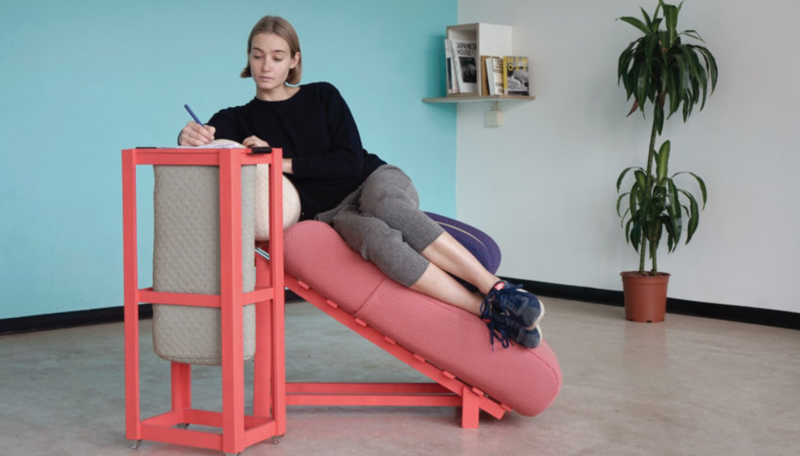 Designer Geoffrey Pascal has created a collection of office furniture in response to the ever-increasing number of people working at home… in their beds. Alright for some perhaps, not us hardworking Clives. 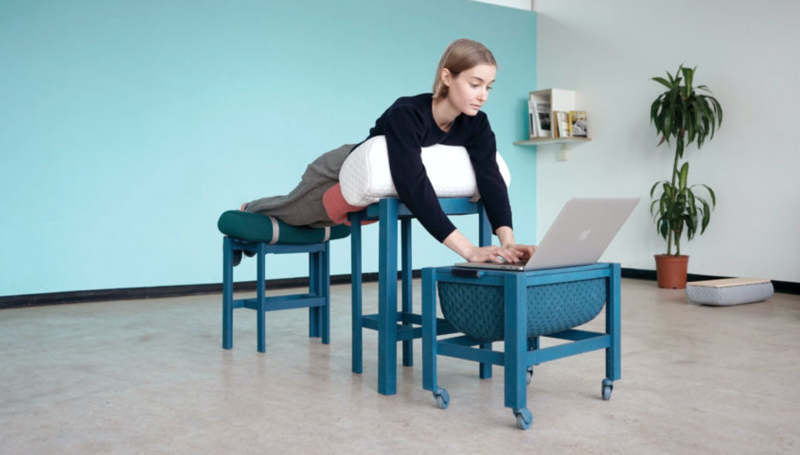 Taking inspiration from NASA’s Neutral Body Position, the innovative workstations spread a person’s weight over multiple points throughout the body. This flies in the face of typical seating convention, which directs force down to the lower back. It might just be crazy enough to work too. 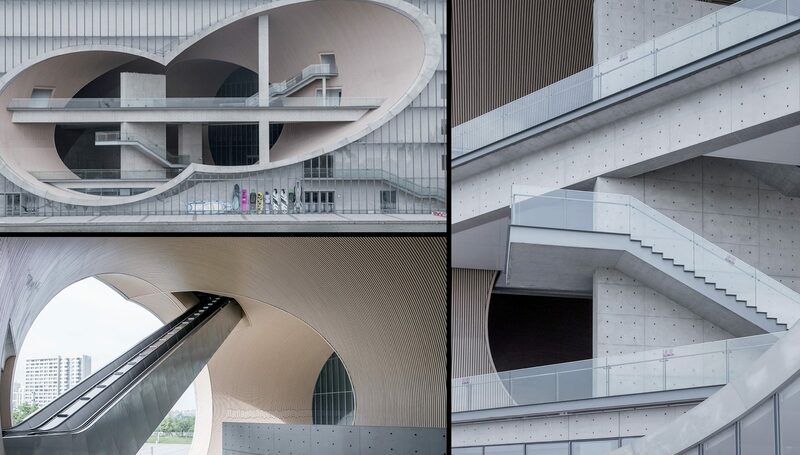 This mind-boggling bit of architecture was designed by self-taught Japanese architect Tadao Ando. The simplicity of the design apparently emphasises the concept of sensation and physical experiences, particularly within Japanese culture. “Zen” has become a recurring theme within Ando’s architecture, which concentrates on inner experiences rather than outward appearance. Located in the Jiading district, an area known for its emerging socio-political identity and a cultural hub, five imposing cylindrical voids cut through the entirety of the rigid structure from all sides. Wow. 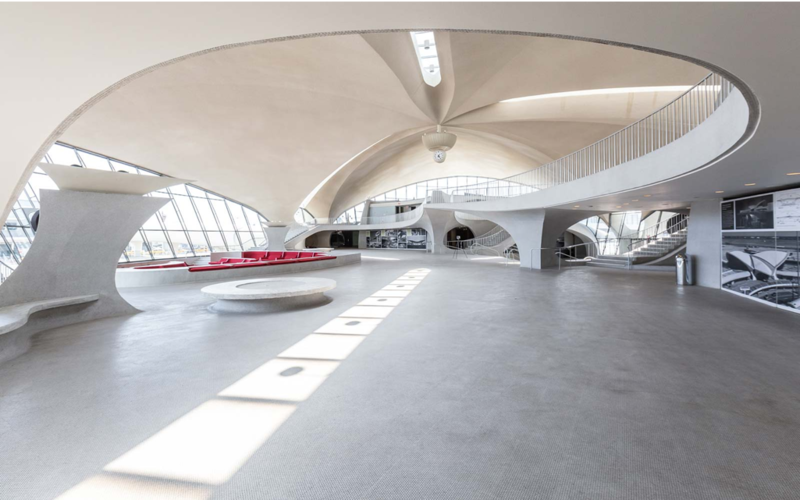 Eero Saarinen’s landmark 1962 TWA Flight Center at JFK Airport is being given a make over and reimagined as a first-class hotel, restoring it to its golden-era glory days. It’ll feature 512 soundproofed guest-rooms, each offering unique views of JFK’s runways and the iconic flight centre itself. Not to mention six restaurants, eight bars, a massive 50,000 square feet of meeting and event space with the capacity to host up to 1,600 people! That’s not all… There will even be a museum devoted to the Jet Age and the midcentury modern design movement, as well as fitness and yoga facilities. Oh and a 10,000-square-foot rooftop observation deck with pool! Yowzer. Opening later this year is the first international offering from The Standard Hotel Group, and it’s on home soil. 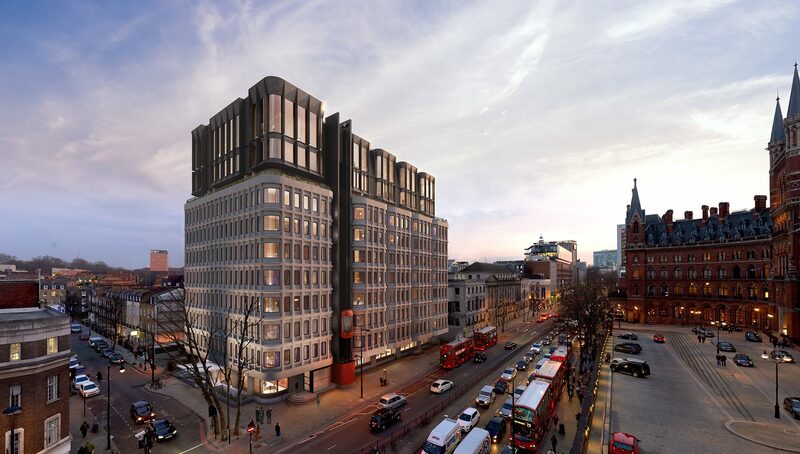 The Standard, London will bring the US-based hotel chain’s quirky culture to the Camden Town Annex, opposite St. Pancras Station. Whilst celebrating the building’s rich history throughout their uniquely designed 266 rooms, their London hotel will also look to the future of the area through its innovative cuisine headed up by leading chefs Adam Rawson and Peter Sanchez-Iglesias. 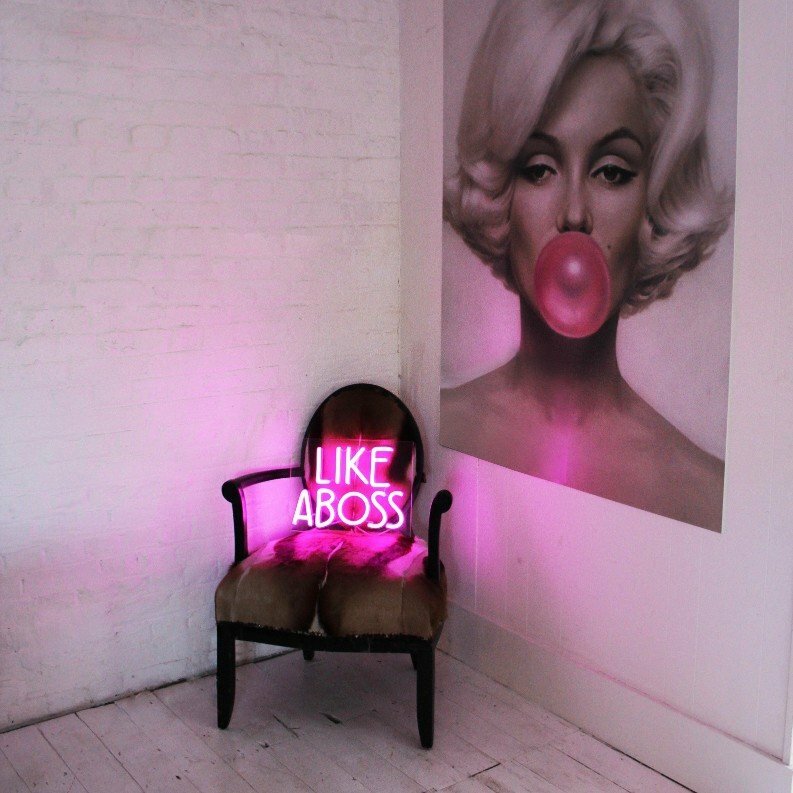 bag&bones is an innovative and eco-friendly LED neon art label born out of a passion for striking design. Operating out of London and Dublin (just like us!) with sister company Cavanagh aka MOTHERPOP, they create unique LED neon lights. Founder Gigi spotted a gap in the market for a new type of neon art that was environmentally sustainable yet still just as vibrant as other methods. By consuming 70-90% less energy than traditional methods, the innovative neon lighting provides a sustainable solution for the planet. Not to mention the running costs are also significantly less too. Ingenious! Inspired by urban street culture, their collection brings a cool aesthetic to any interior. They even offer a bespoke service that brings customers’ ideas to glowing neon life. And best of all, they love what they do, ensuring a service that’s second to none. It’s the moment you’ve all been waiting for… 3D Printed Vegan Steak. Can we get an Amen?! Or maybe that should be ahem. Yep it’s the world’s first 3D meat-free steak and it’s made entirely from plant proteins which apparently mimic the texture of beef. We aren’t convinced just yet, but give it a few years of further development and this is probably the future for those of us who are torn between our love of meat and its ethical implications. Despite an abundance of meat-free products already on the market that may taste similar to animal meat, there are none that reproduce the fibrous flesh of steak or chicken breast. As most people know, cattle rearing is particularly harmful to the environment (not to mention often detrimental to people’s health) – so this was designed to reduce greenhouse gases and be more effectively transported as well as stored. This is another game-changer. This cutting edge bit of touch screen technology has new features for improved meetings capabilities, which include; a 4K camera, hi-tech microphones, support of Microsoft Teams, and biometrics for logging in. These aren’t your average smart boards or interactive whiteboards – the Surface Hub 2 is specially optimised for global teams that want to connect, collaborate, and create regardless of their location. Microsoft states the Hub2 will streamline your group workflow through enhanced collaboration features like multi-user sign-in to simultaneously access and save content to the cloud. In 2020 they also plan to launch the Surface Hub 2X, which features the ability to rotate and tile screens. Check out the video for more on this!